Time for something a little different now! 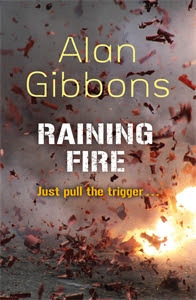 I'm lucky enough to be taking part in the Raining Fire blog tour, so today we have Mr. Alan Gibbons joining us to talk about the inspiration behind the darkness in his work. Read on and I think you'll agree when I say "WOW!" An interviewer once asked me why I wrote about such dark subjects: racism in Caught in the Crossfire, war and terrorism in An Act of Love and The Defender, bullying and suicide in Hold On, domestic violence in the Edge, bereavement in the Lost Boys’ Appreciation Society. I explained that you only walk into a darkened room to find a candle to guide you to the exit. In my fiction, I am constantly tempted into darkness, searching for light. Ethan and Alex, the main protagonists in my new novel Raining Fire, begin their journey in the darkness of an inner city street. They are flirting with a local gang. Its leader, Mattie passes a gun round the group. Ethan is repelled by it, Alex drawn to it like a moth to a flame. A seed is sown that night that will sprout into an evil growth. It will lead Ethan to a terrible dilemma, the cruellest of choices. He can save his brother from injury, even death, but to do it he must take a man’s life. As a young man I lived in Manchester and Salford before moving to Liverpool where I now live. I taught for many years in Merseyside schools. In the course of my career I occasionally observed young people whose lives were blighted by crime and a lack of purpose. Once or twice I came into contact with youngsters whose experiences seemed to have desensitised them to the point of amorality. I was aware of a bleak hinterland in our great cities where the gang can become the family, the beating, the knife and, in thankfully rare and extreme situations, the gun can become the symbols of belonging. In hollowed out communities where services are crumbling and joblessness is common, some youngsters find a purpose in savage postcode battles. Two events brought my concerns into sharp focus. Six years ago eighteen-year-old Sean Mercer fired three shots from a Smith and Wesson handgun. This senseless, brutal act, shocking in its callous casualness, took the life of an innocent boy, eleven-year-old Rhys Jones. On Boxing Day, 2011 another young man, Kiaran Stapleton, took the life of talented student Anuj Bidve, on a night out with friends in Salford. Stapleton adopted the nickname ‘Stapleton.’ It was another random killing, the shocking, pointless theft of a talented man with a wonderful life ahead of him. At first I felt numb with depression as I tried to discover an explanation for these shocking events. I have lived in Liverpool for over thirty years. 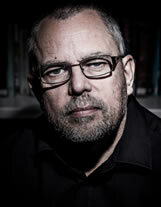 I act as Master of Ceremonies for the Salford Book Award. I am immensely proud of my North West roots. Here, however, two events had occurred that made me feel ashamed. That sense of deep unease at the sub-culture of a minority of youngsters led me to try to find an explanation for their actions. That search laid the foundations of my Raining Fire. I took two brothers. One, Alex, is aimless, uneasy with himself, in search of some kind of purpose. The other, Ethan is bright, academic and a promising footballer. The contrast between them is the main driving force of the narrative. The book was a struggle. I went through two pretty sub-standard drafts. I strayed into territory with which I was unfamiliar, came up with characters and settings that were unconvincing. Finally, I found the key to turning the book around. I returned to what I know and rooted the tale in my own upbringing as the son of a factory worker and a shop assistant, but with a key difference. Ethan and Alex, in a way, two aspects of my own personality, grow up in a North from which most traditional industries have fled. They are working-class without much prospect of work, certainly jobs in which they can have pride. I was examining the detritus of the kind of working class community of my childhood and youth. In the absence of the discipline of the working day, the more dangerous discipline of the gang takes over. If all this sounds bleak, it is because the lives of many youngsters are just that, harsh, dangerous and sometimes tragically short. Gun crime is a fraction of the levels in the US, South Africa or Brazil, but it is a feature of some communities and a menace that cries out for artistic examination. Raining Fire is my answer. Thanks to Alan for an awesome, thought provoking post and to Corinne at Orion for organising this!